The Picturemakers / Y Llunwyr is a group of visual artists based in mid-Wales. Painting, drawing and collage are at the core of our practice which ranges from representational to abstract and more experimental work. Since its foundation in 2006 the group has held over forty exhibitions mostly within Wales, and three are booked for 2019; two in Aberystwyth and one at the Mid Wales Arts Centre near Caersws. Picturemakers exhibit regularly in galleries, art centres and other public venues, however their focus extends beyond this. Regular group meetings provide an opportunity for the discussion of art work where ideas, techniques and approaches are developed and criticised in a mutually supportive environment. We hope that you will enjoy browsing the selection of work presented here (one image per artist) and will also take the opportunity to visit our web site, where you will find more information and links to individual artist's web pages/sites. Individual members can be contacted and may be able to show visitors their studios by special request. Information about our 2019 exhibitions below. Lindsay Davies was born in Altrincham, Cheshire. She has lived in Mid Wales since 1996, working as an Occupational Therapist in Llandrindod Hospital until 2012. The landscape of the Wye valley and Mid Wales are a constant source of inspiration. She is currently working on paintings of the hills around Rhayader and the nature reserve Cors y Llyn. Rosemary Fahimi left school at 16 to work with horses and emigrated to Canada at 19. She returned to the UK in 1988 to run a hill farm and later to study at Aberystwyth University; initially a BA and subsequently an MA in fine art. She now finds that working both as a farmer and as an artist gives her a uniquely holistic view of the countryside, its animals and its people. She uses the subjects that are all around her and that she is part of, allowing her to give them life on canvas, wood engravings, or in sculpture. Philip Huckin draws and paints the Welsh landscape. He was awarded a scholarship by his old university, Aberystwyth and completed an MA in 2012. He has had shows in galleries in England and Wales and has work in private and Welsh national collections, including MOMA Machynlleth and The National Library of Wales. Kim James-Williams draws anything that catches her eye: boats, waves, dog-walkers, pram-pushers, sea frets and fishermen’s nets. Her drawings are about seeing the sublime in the everyday. When she draws, she tries to see with ‘new eyes’ things which may have been drawn and looked at many times before. She likes the ink or watercolour to be defeated by gravity and remind us that it is ink scratched into wood pulp at the same time as being a drawing of something. Kim studied art at Carmarthen College of Technology and Art (Foundation), BA Fine Art (hons) at Winchester School of Art and MA Fine Art at University of Wales, Aberystwyth School of Art. Mike Laxton was born in Kent. He followed a career teaching Design in Secondary, Further and Higher Education. Though by training he has worked mainly with construction materials and related technology, he has always envied the freedom of expression that painting seem to have. He moved to Wales in 2007 and, following a course at the Art Centre in Aberystwyth, he has begun the journey to find a personal use of medium and image. Mike has exhibited at Aberystwyth Art Centre, MOMA in Machynlleth and as a gallery artist at Plas Glyn-y-Weddw Llanbedrog. Greteli Morton An ecologist, teacher and gardener, Greteli has always been inspired by the details of the natural world. For her, water-worn or weathered wood can be as exciting as sculpture and the ripples of peat-stained water are the worthy subject of a photographic study. From a young age Greteli has picked up or photographed beautiful things wherever she has gone and continues to surround herself with natural art. At the entrance to her studio in Penrhyncoch, beach glass, pebbles and fossils encased in resin form a glowing window panel. Patrick has been captivated by painting from an early age. His early recollections are of a Victorian pastoral scene with long horned cattle in his grandparents' home and later, hanging in school corridors, reproductions of paintings by the great masters. He attended adult evening classes in life painting for many years and became a weekend painter of London Parks and views along the Regents Canal. He now lives in Wales and paints its landscape, the occasional portrait and still life. He paints almost exclusively in oils directly from the subject. Karl Sylvester studied art in Edinburgh, and has been based in Mid Wales since 2003. He works mainly in oil and charcoal, and his favoured subjects are landscape, figurative and still life. He demonstrates a painterly use of oils. He has exhibited widely throughout Wales and runs courses and workshops locally. Shelley Upton . The one time chef and restaurateur moved to Wales and worked as a seamstress until 1993 when she undertook the BSc (Hons) in Computer Science and subsequently worked for many years in Information Services at Aberystwyth University. The stimulation first derived from Life Long Learning art courses that she undertook as creative ‘release’ from her highly competitive working life re-kindled her passion for painting and allowed her to fully explore her creative side. She currently takes her inspiration from the coasts and hills of Ceredigion and Pembrokeshire. Moira Vincentelli began to study fine art after retiring from forty years teaching art history at Aberystwyth University. She works in figurative drawing, painting and collage often with photographic elements. Inspired by figures in movement and gender politics, recent subjects include images of the refugee crisis, hijabis and dancers. Ann Williams has exhibited with a number of groups and has work in private collections in Britain, Canada, the Netherlands and Sweden. Her work shows the artistic process of recording images as seen and then pushing that process forward, often arriving at semi-abstract conclusions. She creates her pictures to convey her sense of place and hopes the paintings will make the viewer see their environment in a new way. 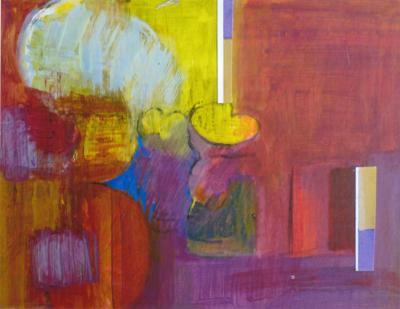 She as held both solo and joint exhibitions recently at both MOMA Machynlleth and Aberystwyth Arts centre. Alistair Crawford lived in West Wales from 1974 to 2010, when he moved to Suffolk. Painter, printmaker, curator, art historian, writer, performer, he became the first Professor of Art in the history of Wales. Distinctions include invited academician of the Royal Cambrian Academy and Honorary Fellow of the Royal Society of Painter-Printmakers. He exhibits internationally and is represented world wide.